Originally, the Delaware territory encompassed much of the east coast of North America. They lived up and down the Hudson and Delaware Rivers and their tributaries throughout the region stretching from Connecticut, through New York, Pennsylvania, New Jersey and parts of Maryland. They call themselves Lenape, which translates to mean “human being” or “the People”. Other Nations regard the Lenape as the Grandfather Nation, as it is believed to be the original tribe from which others developed. The Lenape were first mentioned in the early 1600s by Dutch colonialists. The Dutch were soon followed by Swedish and then English colonists. The term Delaware was given to the Lenape by the English due to the existence of Lenape villages along the Delaware River and around Delaware Bay. The English had named the river and bay after Lord de la Warr, Sir Thomas West, Governor of the Jamestown colony in Virginia. The Delaware are part of the great Algonquian language family. Within the Delaware language, there are two different dialects: Munsee and Unami. Both are taught today in order to ensure the preservation and continuation of the language. Unami is spoken mainly in Lenape communities in the US; Munsee in Canada. Lenape society included alliances with surrounding Nations, which were reinforced through trade relationships and marriages. Traditionally, the Delaware were a matrilineal society. Examples include the tradition of children belonging to their mother’s clan; when a marriage takes place, the man lives with his new wife’s family; and the mothers and grandmothers were given the responsibility of choosing the Nation’s leaders, and had great influence over the tribe’s decision making. 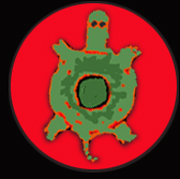 The Lenape originally had three clans: Turtle, Turkey and Wolf. However, much of this knowledge as been lost through 400 years of colonization. At one time, it is believed he Delaware had as many as twelve different clans. The Delaware lived in homes built of saplings and bark, which they called wigwams. The domed-shaped structures were built strategically, taking into account prevailing winds and precipitation, the shape withstood strong winds, and the building style could be expanded to accommodate growing families. Matts, hides and open fires inside the wigwams maximized comfort throughout the year. Traditionally, women and men had different roles in the community, but they were equal. Hunting and fishing were tasks that men were traditionally responsible for, while the women tended crops such as corn, beans and squash. 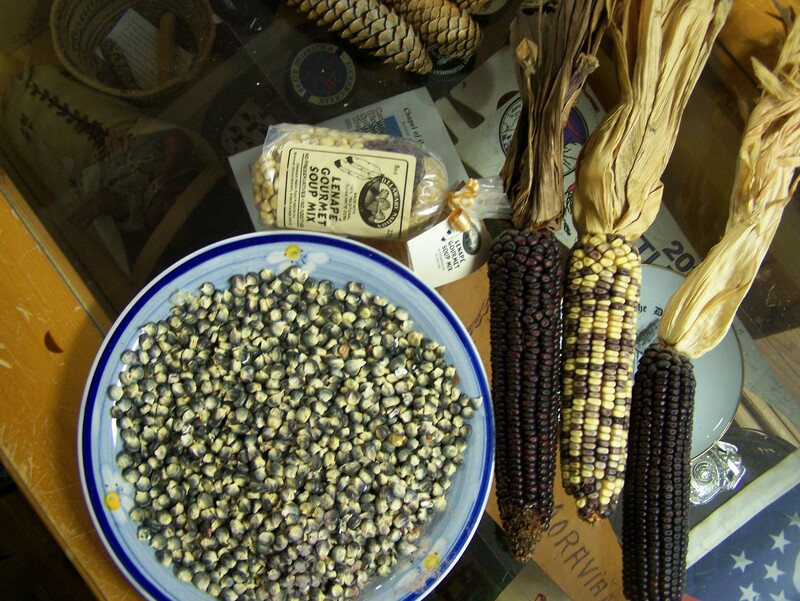 This way of life required a semi-nomadic lifestyle as Lenape families and groups would move with the seasons, gathering wild plants and berries, harvesting crops, hunting and fishing throughout different times of the year. Each season was celebrated by different spiritual ceremonies. In the spiritual worldview of the Lenape, all beings are created and given a soul by the Creator, Kishelëmùkònk: people, animals, plants, trees and water. Spirituality played a crucial role in every individual’s life. That all changed radically with the arrival of the first Europeans. Many Delaware died from unknown and devastating diseases brought by the Europeans. Increasingly, there were also tensions with the colonialists. William Penn, the founder of the Pennsylvania colony, had a desire to share the land and live peacefully with his “brothers,” the Indians. His followers rejected this idea –since they wanted to secure the land of the Lenape. A number of land contracts were completedwhich tricked the Lenape, such as the “Walking Purchase” of 1737. The idea that one could own land was an unknown concept for the Lenape. The gifts of the Europeans were a sign of friendship and symbolized the future sharing of the country given to them by the Creator. Until the 17th century, the Delaware did not consider themselves a political entity. They lived in many small groups with their own chiefs. The settlements of Europeans drove the Delaware from their ancestral homeland: some gathering with other tribes in the Ohio Valley. The Ohio Valley would later play a pivotal role during the Seven Years’ War. The Delaware first fought with the French but were later defeated, resulting in a further westward migration. Every war pushed the Delaware further west. Eventually, the dispossessed Lenape gathered together first in Indiana Territory and then migrated to Oklahoma, where two groups live todaym speaking the Unami dialect. These are the Delaware Tribe of Indians in eastern Oklahoma and the Delaware Nation in western Oklahoma. The other group of Lenape, who spoke the Munsee dialect, migrated north, Today, this group is found mostly in Ontario, Canada, where they primarily reside in two new communities, the Delaware Nation at Moraviantown and the Munsee Delaware Nation. During the American Revolutionary War, the Moravian missionaries sought strict neutrality in order to protect themselves and the Delaware Indians, or Lenape living with them. 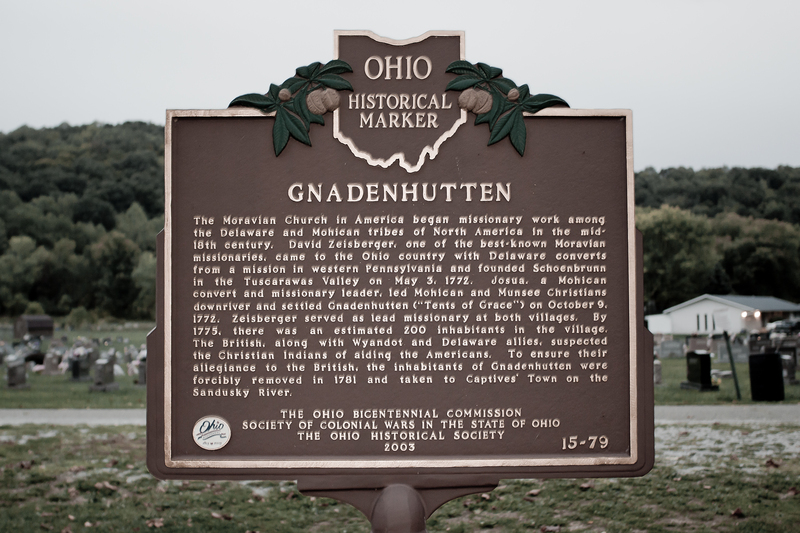 However, a meeting at the mission settlement Gnadenhütten, Ohio between the missionary David Zeisberger and the American commander of Fort Pitt, soon aroused the suspicion of British troops in the west. The mission settlement got caught in the crossfire. The British suspected the missionaries to be American spies and captured them with the help of their allies, the Wyandot, and dragged them in the winter of 1781 to the Upper Sandusky River. In March 1782, hunger drove some of the Lenape (former??) converts back to their abandoned settlements in search of cached food from previous year’s harvests. 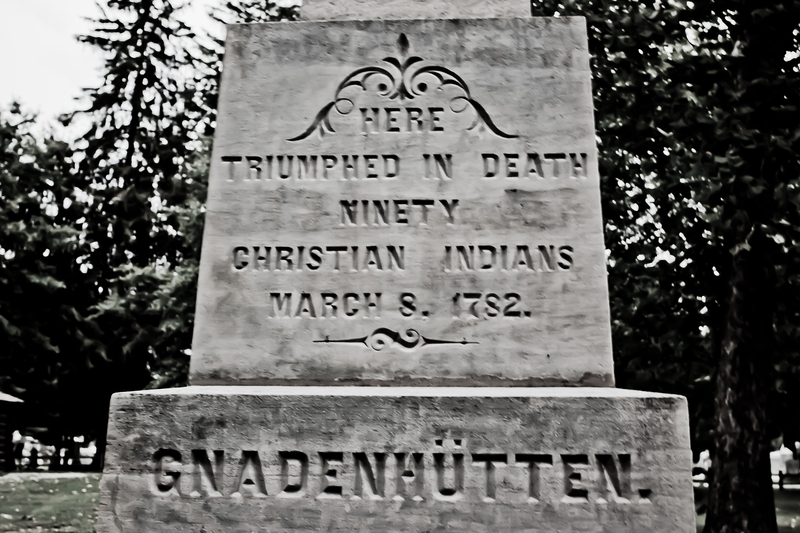 American troops, under the command of Colonel David Williamson, tracked down the Lenape Christians, killing a total of 96 men, women and children. Two children survived, one of whom had been scalped. They reported that the soldiers first imprisoned the converts, then led them out two-by-two and bludgeoned them to death with a mallet. This event would influence the relationship between the Lenape and the Moravians, as they blamed the missionaries for delivering them to the soldiers. A small memorial in Gnadenhütten commemorates this tragic event today.